A young adult, fictional reimagining of Truman Capote's In Cold Blood and the brutal murders that inspired it. Gripping and fast-paced, this meticulously researched historical fiction will reinvigorate a new generation to Capote. November is usually quiet in Holcomb, Kansas, but in 1959, the town is shattered by the quadruple murder of the Clutter family. Suspicion falls on Nancy Clutter’s boyfriend, Bobby Rupp, the last one to see them alive. New Yorker Carly Fleming, new to the small Midwestern town, is an outsider. She tutored Nancy, and (in private, at least) they were close. Carly and Bobby were the only ones who saw that Nancy was always performing, and that she was cracking under the pressure of being Holcomb’s golden girl. This secret connected Carly and Bobby. Now that Bobby is an outsider, too, they’re bound closer than ever. Determined to clear Bobby’s name, Carly dives into the murder investigation and ends up in trouble with the local authorities. But that’s nothing compared to the wrath she faces from Holcomb once the real perpetrators are caught. When her father is appointed to defend the killers of the Clutter family, the entire town labels the Flemings as traitors. Now Carly must fight for what she knows is right. Amy Brashear was born in Arkansas but spent her elementary school years in Garden City, Kansas, just six miles from Holcomb. Amy heard about the Clutter family murders from a childhood friend, though it wasn’t until she read In Cold Blood that she finally understood their significance. 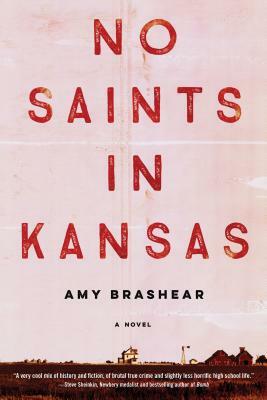 No Saints in Kansas is her debut novel. She is also the author of the forthcoming YA book The Incredible Story of the Making of the Eve of Destruction. "Will appeal to readers struggling with social issues, including bullying, ostracism, and mortality. A good introduction to Capote's famous novel and true crime." "A fresh point of view." "A very cool mix of history and fiction, of brutal true crime, and slightly less horrific high school life."